Cape vulture numbers have decreased drastically over the past years, and the total population is estimated at only 18 000 birds. Only about 100 birds, including 32 breeding pairs, occur in the Western Cape. Various factors are responsible for this decline, especially poisoning, electrocution, disturbance at breeding colonies, habitat loss and food shortage. They clean the veld of rotting carcasses, thereby preventing diseases such as anthrax and plagues of blowfly. Vultures circling in the air provide farmers with a good indication of the locality of a dead animal. A post-mortem examination may then be carried out to prevent the spread of undesirable diseases. The presence of vultures on a farm is an indicator that the environment is safe for wildlife and man. Vultures have an important ecotourism value. Vultures need good publicity for the free service they perform to farmers by cleaning carcasses and keepng the veld free from diseases. We can all help spread this message. Farmers have a special responsibility with regard to the careful use of organophosphates and other poisons. Carcasses that have i)een recently treated with any chemical substance, either internally or externally, should be removed from the reach of vultures. In areas where vultures still occur, uncontaminated carcasses may be left In the veld. Note that the Potberg vultures seem to prefer the small, white carcasses of sheep or goats to donkeys, cows and horses. The equation is simple: more food = more vultures. Please report sightings of live, ringed or dead birds to the contact numbers below. The Overberg Vulture Group is a working group of Cape Nature Conservation and aims to promote the conservation of vultures in the Overberg region through the active involvement of the community. 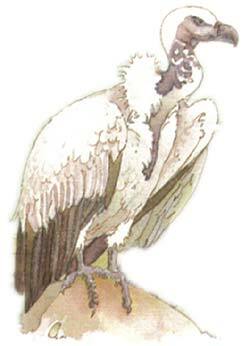 The group is affiliated to the Vulture Study Group of the Endangered Wildlife Trust. Please contact Cape Nature Conservation at the numbers below if you would like to become involved. Dysselsdorp was established in 1838 by the London Missionary Society.